What does the Progress Graph show? Each time you check your writing, your level appears in the graph at the bottom of the screen. This article explains what this graph shows. 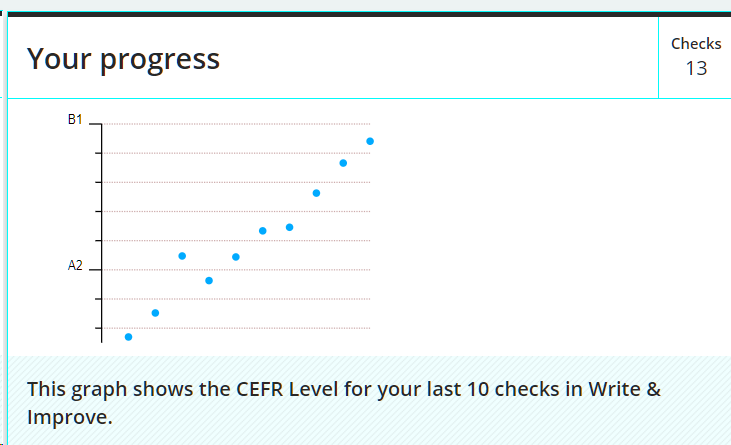 The progress graph shows the CEFR level or exam grade (if you are writing in +Test Zone) for the last 10 checks you made in Write & Improve. So, if you check a particular essay 10 times, you will see the level or grade you got for each time you checked that particular essay. If you only check each essay you write once, the graph shows your level for the last 10 essays. The graph is useful because you can see the progress that you make between levels, with each time you make changes to your writing. So, even if you do not raise your level, you can see that you are still making progress towards your goal.